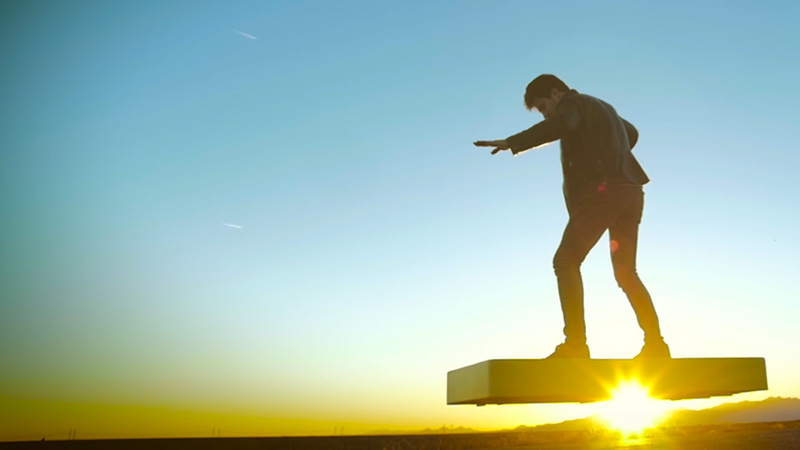 With a six-minute battery life, it's the fan-powered hoverboard no one asked for. We don't like that those small, self-balancing and oft-exploding scooter things have come to be called "hoverboards" any more than you do. After all, they don't even hover. Today, though, ARCA Space Corporation claims to be the latest company to have developed something worthy of the name, though it's not what Back to the Future promised us exactly. If Lexus' version of the hoverboard was an exercise in physics (using quantum levitation on grand scale), then ARCA's is an exercise in engineering, and elegant it is not. The ArcaBoard uses good, old-fashioned upthrust to float in mid-air, with 36 electic fans kicking out 272 horsepower. And one can (almost certainly not) be yours for the meagre pre-order price of $19,900. You apparently steer this "revolutionary breakthrough for transportation" using your smartphone, though you can disable the stabilization system and use your body weight instead if you're feeling particularly extreme. The ArcaBoard has a software-limited top speed of 12.5MPH, which you can enjoy for all of six minutes before the batteries run dry, or only three if you're a heavier rider requiring the "Enhanced Thrust Version." A full recharge takes six hours, but the optional $4,500 ArcaDock accessory will cut that down to just 35 minutes. We could go on, regurgitating every bit of information ARCA's website has to offer, but it'd probably be a waste of breath. The ArcaBoard has vaporware written all over it, and is most likely the worst kind of attention-grabbing PR stunt. The concept itself is pretty simple, of course: Enough upthrust plus many individual fans for stability equals hoverboard. Aside from the fact you'd be silly to spend almost 20 grand on a slab that can float for three to six minutes, the product and company are one enormous red flag. First, there's the timing of this announcement. Utter the word hoverboard on one of the slowest news days of the year and journalists will be falling over themselves to cover it. Then there's all the accompanying marketing materials, which are suspiciously slick and full of cringe-inducing, inspirational accounts of the development process. Even the idea for the ArcaBoard itself began as the dream of a child, because of course it did. The glossy, too-good-to-be-true vibe is inescapable, leading us to bet the ArcaBoard won't really begin shipping in April 2016 as the company has promised. And can you really move around on this thing as the company claims, because the footage appears to show a pretty unstable, wandering block of fans and batteries? Lest we forget, what is ARCA Space Corporation anyway? Well, it used to be a non-governmental organization based in Romania, established in 1999 to develop rockets and other aerospace technology. Moving to Las Cruces, New Mexico last year, it adopted the name ARCA Space Corporation. The company's currently developing rocket systems and serious, commercial drones (that seem to be behind schedule), but its history is a bit mysterious for our liking. In more than 15 years, it's performed numerous tests of aerospace technology, but we can't see that the outfit has ever really done, made or sold anything. Thus, we reckon it's incredibly unlikely that the first commercial product ARCA Space Corporation will actually deliver is going to be an overpriced hoverboard no one wants.